Shopping online is all the rage these days … even for food! Obviously, this is a huge time saver, but do you ever wonder if it’s saving you any money as well? 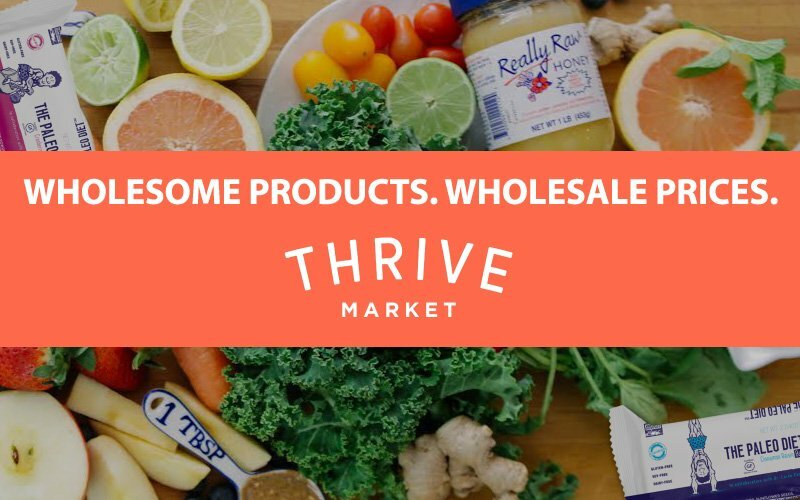 Today we are partnering with Thrive Market to show you 14 products you can buy on their website for less money than you’d spend in the store. This list would be a fabulous start if you want to stock up on some of the basics! And be sure to read on, because you can try out Thrive Market for free for 30 days and we’ve asked them for discounts on your first 3 purchases, too! Thrive Market is basically an online health food store, which is perfect for those who don’t have one nearby (or can’t always find the time to go to one in person). Can anyone else relate? :) Thrive Market’s mission is to make healthy living and organic food accessible to everyone (delivered right to your door!) — regardless of where you live or how much you make. 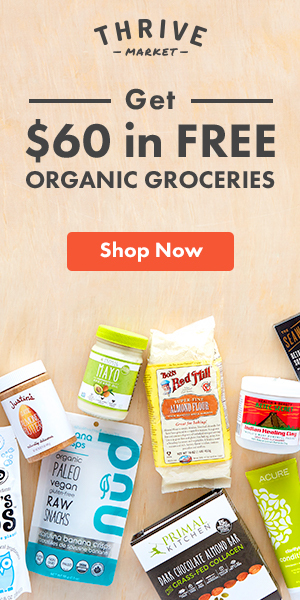 You can get everything you need: organic food, snacks, vitamins, personal care products, eco-friendly cleaning supplies, safe and nontoxic beauty products, kitchen staples, home goods, organic baby food, kids products and much more at discounted prices. Did we also mention no need to drive to the store or wait in line? Love the time savings. 25–50% off trusted brands like Tom’s of Maine, Bob’s Red Mill, Annie’s Homegrown, Seventh Generation and more. When you join, Thrive Market will donate a free membership to a low-income family, veteran, student or teacher on your behalf (love this!). Your membership* will pay for itself in savings within the year, guaranteed. If not, you get the difference in Thrive Market credit when you renew! As you can see, Thrive Market will not only save you money (an average of 29% for the products in our comparison) but also save you the time of heading to the store – a great option if you don’t have one nearby. Try out Thrive Market for FREE! *Membership is $59.95/annually. Shipping is free on orders over $49. Hi! I’ve inquired a few times, but Thrive does not ship to Alaska. :( I am so bummed as there are many people up here that would utilize it. Especially in the villages as they do not have access to healthy foods…only the foods that are stocked in the local stores which are VERY expensive. I myself would love to order. We only have one store in Anchorage that sells natural/healthy foods. I meant to say we do NOT get everything organic. And Fred Meyer has a great choice of healthy/natural foods and cleaning/beauty items. Thrive looks like it’s worth it if you mostly shop at Whole Foods or another specialty store. I’ll stick with my local grocery store that stocks whole-bean coffee (Fair trade) for $0.62/oz, spices for around $1/oz and peppermint tea for $2 for a box of 20. Ditto. Whole Foods is ridiculously expensive. They should include a regular grocery store for a more comprehensive comparison. Exactly my thoughts! They also don’t factor in the price of the membership! I will stick to kroger and Costco! That is exactly what I was thinking. Many grocery stores have health food sections with these products at prices that are way better than whole foods. Agree! Since Whole Foods is so much more expensive than several local grocery stores (which sell the same things), this makes Thrive look pretty expensive still. I wonder if it’s a location thing? I would have to go to three local grocery stores to get all of the items I can get in one trip at Whole Foods and even then I wouldn’t be able to get everything. The prices are cheaper than what’s on this list for the WF in our neighborhood but the other WF in our city *is* more expensive (but also bigger). I went online to buy some essential oil and bought it from Thrive. Little did I know they would be charging me an extra $60 for a membership there, and didn’t even make it clear to me that that was happening during the checkout process! I only found out a year later when I was billed for it again! When I complained they wouldn’t refund my membership, but cancelled it for me, then said I could use the money I had paid for my membership towards products on the site. When I went to go do so I found that if I was to complete the transaction I would be billed for another membership! These people are obviously scammers! Buy from someone else its not worth it! I’m glad the Leakes have found a way to make a living doing something they enjoy. When they started, most of what they sent out was relevant to me. But it has come to the point that most of what they send out is to encourage us to buy from a “partner”, which means if you spend $$ there, the Leakes also make some cash. I just unsubscribed. Agreed. Emails now are just links to products or services to buy. No useful, meaningful information. Simply marketing ploys. I agree, don’t compare everything to Whole Foods. Bella Terra and Trader Joe’s both have organic spaghetti for under $2, Hodgson’s Mill is also cheaper though not organic. Quinoa is around .20 per ounce at Aldi. I have a mental list of where to find specific grocery items at the best price and shop accordingly. Whole Foods is almost never the cheapest. Also, one must take into account the $60 Thrive membership before counting any savings. I will pay the non-member price at my local coop, because I do not buy enough there to warrant paying the membership. I’m really hoping to see more recipe ideas, lunch box ideas, and tutorials – practical every things for our families! I appreciate your keeping everyone informed of options out there. While I love Trader Joe’s, it’s over an hour from me, and isn’t practical. Not everyone lives near good organic shopping. I, personally, consider the time and gas when looking at the fee. I have not joined yet, as it is a consideration. Thanks for the info! I have found Thrive Market to be less expensive than my Natural Grocer’s, which is much more reasonable than Whole Foods (also known as Whole Paycheck). In doing price comparisons, the amount ranged from a few cents cheaper to $10 less (on an adrenal support supplement). Their shipping is always fast and if there was ever any issue (I had a broken bottle), it was replaced without question. They try to use minimal plastics in the shipping. I also like that they donate a membership to a needy family, too.